Fore! ... No, Three for Hoam! Due to increased Thursday night competition this year, Pro Golf fell to 54 participants as this late night WBC tradition recorded its lowest attendance in nine years. However, with the new 18 hole format and a firmer hand from the GM, this year's event was the smoothest in years and much shorter than some of our prior marathons. 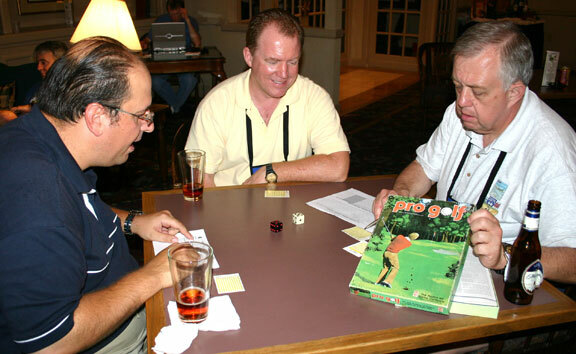 After receiving their instructions, the players scattered to play their 18 holes on the 2002 version of the Augusta course and report back their scores to the clubhouse in the plush Hopewell room. Charles Squibb was the qualifying round leader at 9 under par, followed by Nate Hoam and John Coussis at 6 under. There were six players tied for the last Skins game spot, as Dan Dolan, Jr. just barely reached the room in time for a sudden death playoff with Lisa Gutermuth, Ken Gutermuth, Richard Irving, Alan Kaiser and Eric Lenhart. The father and daughter Gutermuth tandem and Dan Dolan posted birdies on the first sudden death hole to eliminate the other three players, then Ken brushed aside his daughter and the young Dolan by scoring a birdie on the second straight hole at Pebble Beach to advance to the Skins game Final for the umpteenth time. After the initial18 holes at Augusta and the two sudden death holes at Pebble Beach, the top four players were transported to Muirfield Village in Dublin Ohio, home of the Memorial tournament, for the 12 hole Skins game. Before the start of the Skins game, each player was allowed to replace their golfer with one of the legends of the game. The good Revered Keith Hunsinger, the voice of Slapshot, did the stroke by stroke color commentary over the PA system, doing his best Ben Wright impersonation to heckle the lesser shots achieved by the players. Nate Hoam's Ben Hogan grabbed an early skin on the first hole with the only birdie in the field. After the next three holes were halved, Hoam again birdied hole #5 to accumulate four more Skins. Hole #6 was halved (fortunately for Nate who bogeyed) and then hole #7 saw Ken Gutermuth dramatically halve the hole by matching John Coussis' eagle. Hole #8 was also halved, but Nate then birdied #9 to obtain his ninth skin and win the tournament and his third Century Wood of the week. 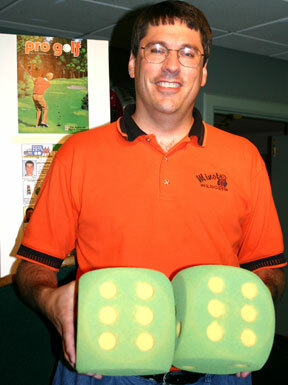 Arnold Palmer came through for John on the 12th hole as he earned the last three Skins and second place. It turns out this was the only hole that John and Ken did not match scores for the entire twelve holes. Ken then beat out Charles Squabb in a roll off for third place, as Charles hot dice in the qualifying round were replaced by the cold cruel fuzzy dice in the Final. The entire event finished about 90 minutes earlier than normal, a fact the GM and players surely appreciated when gaming started Friday morning.